The face of medical marijuana in Colorado is changing. Women make up a larger share of the patient population in Colorado than at any other time since the industry’s birth in 2009, with females accounting for 35% of the patient base today compared with 28.5% six years ago, according to reports from the Department of Public Health and Environment. 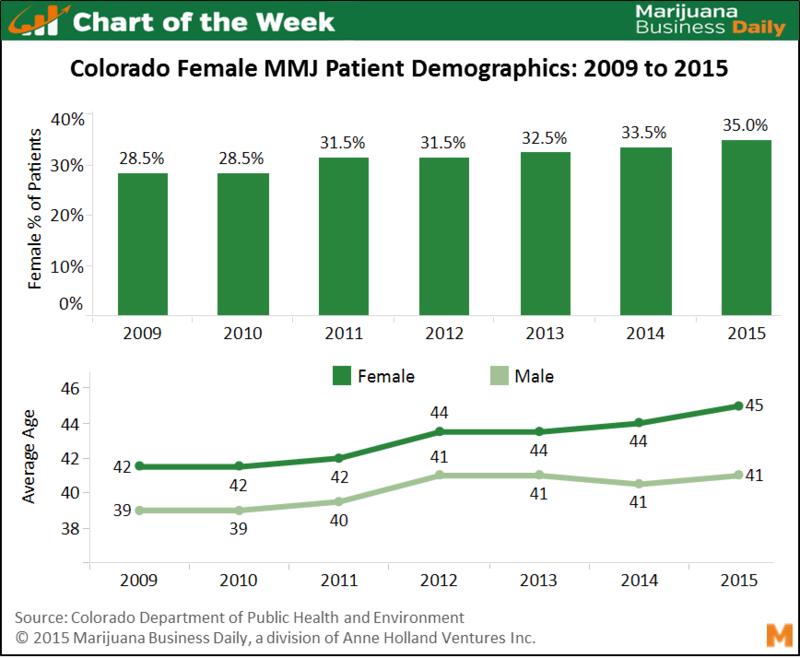 The average age of women patients in Colorado has also risen, from 42 in 2009 to 45 in 2015 – higher than the current average for men of 41. The shift mirrors trends in the marijuana industry as a whole, where women are playing an increasing role as both consumers and business professionals. The industry itself hasn’t traditionally embraced women, often using images of scantily clad females in advertising and marketing as part of an effort to appeal to men. As the data in Colorado shows, cannabis businesses that engage in these tactics are alienating a key segment of the market, leaving plenty of revenue on the table. Women are a growing and vocal part of the consumer base in general. They make up to 80% of family healthcare decisions and account for 85% of all consumer purchases these days, according to the U.S. Department of Labor and other research gathered by TheNextWeb.com. Women also account for about $7 trillion in annual consumer spending in the U.S. Some marijuana businesses have taken notice of this demographic and are now specifically manufacturing and marketing cannabis products for women. Infused edibles such as baked goods and topicals such as lotions, lip balms and beauty products are just a few examples of how savvy marijuana entrepreneurs are capitalizing on the emergence of the female marijuana user. “The woman consumer is usually looking for a low-anxiety product that calms nerves and also helps with sleep. [They want] something that is either task-orientated for a day experience with low anxiety and/or a sleepy calming edible for the evening,” according to Julie Dooley, owner of Julie’s Natural Edibles in Colorado. Topicals also tend to be popular with medical patients, particularly women, because they offer therapeutic effects without the euphoria. Women also tend to be more apprehensive about visiting dispensaries. “Men are not as afraid to check out a dispensary, while my female consumers are very cautious and private,” Dooley said. Companies that take note of this demographic by offering these types of products in a safe and upscale environment are working to tap into this part of the market by breaking down some of the sexism or stereotypes that may have kept them away until now.